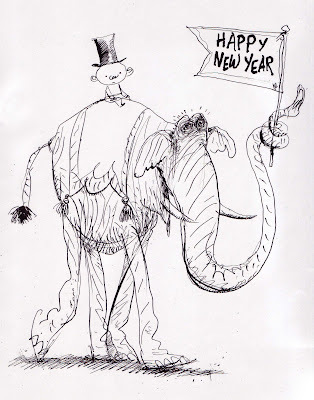 A very happy new year! 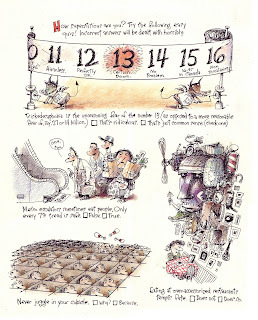 And a reminder: you've only got a few hours to take care of those Resolutions for 2011. 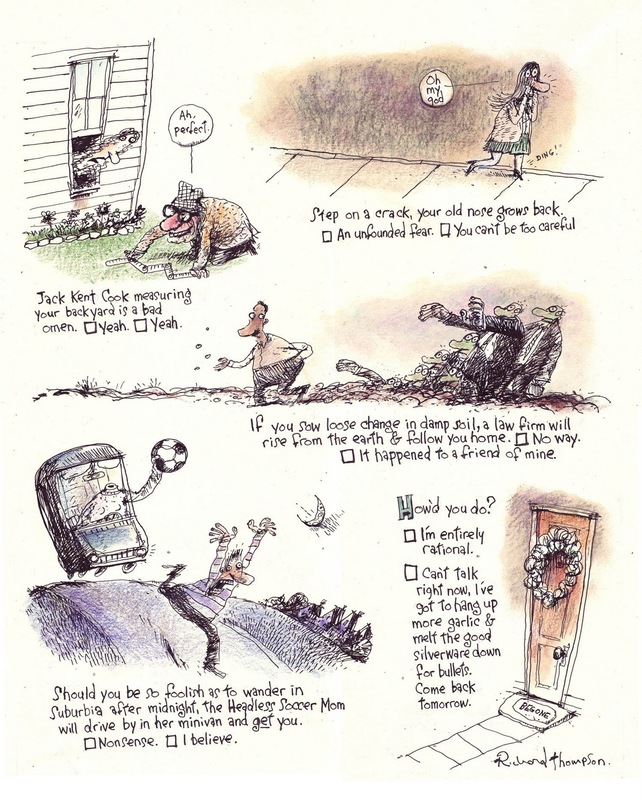 I did this in 1997, on the 100th anniversary of the editorial, and I'm reposting it here from the last two year's Christmastime blog. It's all true, though I might've exaggerated the moustache. Right now most I'm unable to access most of my computer stuff, including email, as I'm outta town, so I'm patching this together from an old post. Thank you all for all your comments, support, suggestions, jokes, complaints, insights and just for reading this stuff. I hope you all have a lovely holiday season (is that general enough to cover everybody?) and that 2011 is in every way an improvement on 2010! So this time I thought we'd view the audience instead of the Holiday Concert, and just to heighten the drama I threw in whatsername from way back when. First let me just say that I'm a big fan of the contrabassoon. It sounds like nothing else and adds a growly undertow to some of my favorite orchestral pieces and it's physically imposing. Most instruments are evolved, not planned, and the cb is one of the more exotic developments. But you know, it does go urngk urngk. 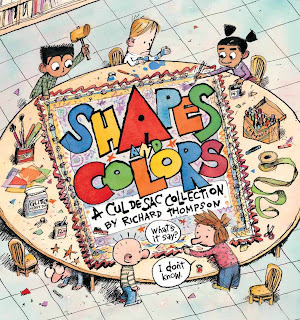 I'll be signing whatever Cul de Sac books are put in front of me at the brand spanking new One More Page bookstore tomorrow, Monday, December 20th from 7 till 9 PM. One More Page is located at 2200 N. Westmoreland Street, #101, in Arlington VA, phone 703-300-9746, just a few blocks west of the Lee Highway exit off Route 66. The signing will likely take place right next door at the party room that's part of the condominiums upstairs. I'm told there'll be coffee and snacks and a fireplace. Everybody please come support indie booksellers in general and proprietor Eileen McGervey in particular! One More Page pre-opening. The little paper in the window is notice of application for a liquor license. Finally, a bookstore with its priorities straight. This follows nicely on Saturday's strip, which is pretty impressive as I drew the Sunday a month or so ago but only did the Saturday a few weeks back. And that's the only thing that's impressive about it really; the Sunday strip has a few good moments but it needs a stronger finish. Mr. Otterloop just didn't come through with a sharp enough zinger. But Petey's dense wad of foil makes me happy. 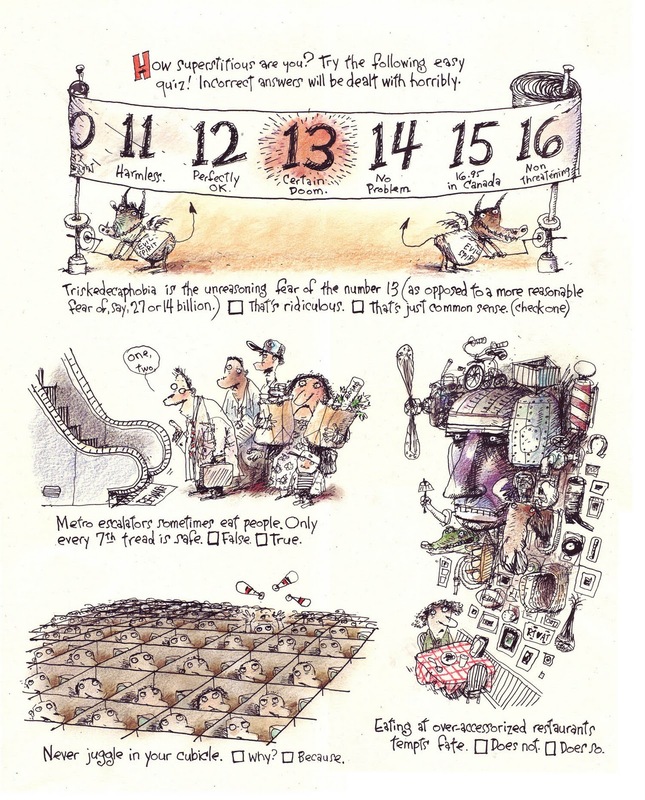 So here's an Almanack from 2006. Some of the jokes are outdated, but it's got a decent Christmas sweater gag and I like the Alastair Sim/Peter Billingsley mashup. Our semi-annual dash through a week's plus worth of Cul de Sac. Clapping rhythmically is an important social skill. This is a variation on a yearly purchase by Mrs. Otterloop. Last year's sweater kept displaying Halloween and the Fourth of July before finally, in a moment of great and heart-stirring beauty, erupting in Christmas. This was fun to draw, in a lazy kinda way. There's a joke in here somewhere, I'm almost sure. 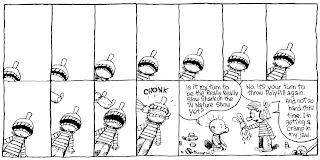 The best thing in this is: Petey stops wagging his foot in the center panel. I always suspected they shared a fashion sense. These hats exist, and people do put them on their heads. And they are fun to draw. Christmas trees are likewise fun to draw. I did a whole series of Christmas Tree Almanacs, which I'll post when I get the time and Hell freezes over. Mr. Otterloop's last line is lifted from one of them. Reminder of Exciting Upcoming Thing Again! 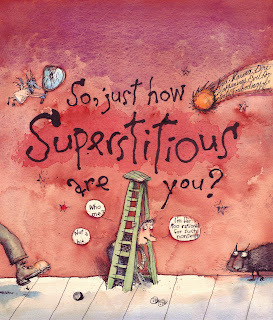 For those interested here's the whole of the superstition cartoon that's posted on Illustration Art. I drew it for the Washington Post Weekend section back in September of 1996 and it appeared on Friday the 13th. One particular reference is understood only if you lived in the DC area in the mid-90s. Jack Kent Cook then owned the Redskins and he was looking around for a place to build a new and better stadium. Several neighborhoods were worried about being within the event horizon of a mammoth sports arena. 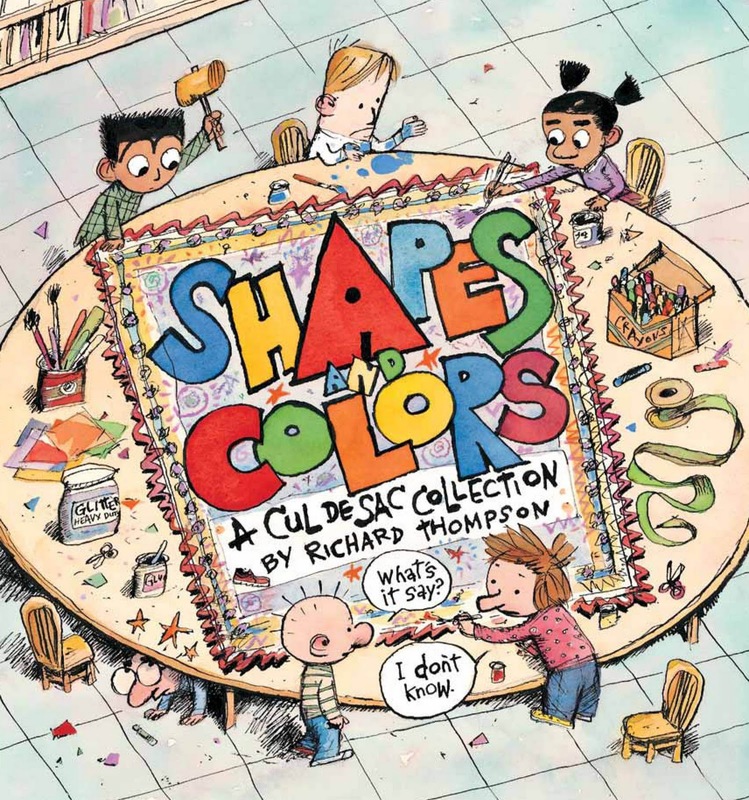 The cover is watercolor; the inside pages are in colored pencils and pastel blotted with alkyd medium. 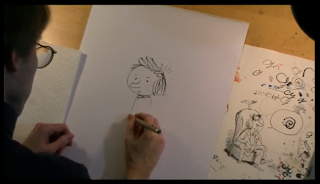 And pen and ink of course. 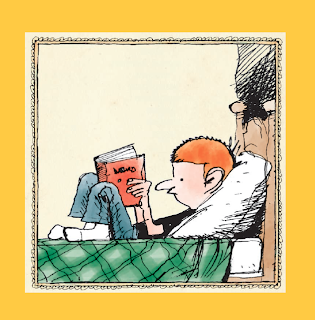 David Apatoff, a knowledgeable connoisseur and avid fan of all kinds of art who runs the blog Illustration Art, found a piece I did for the Washington Post Weekend section back in 1996 and says some awfully nice things about it. David's blog features work by a wide range of excellent artists & illustrators and is always worth reading and staring at lovingly. I'm honored to be there! 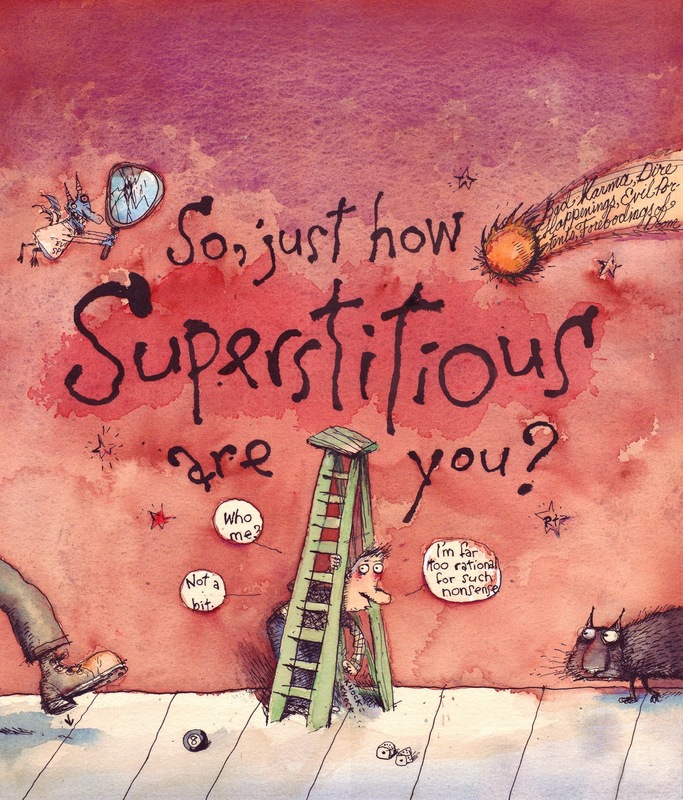 Mike Rhode, the noted comics expert, historian, monster-bottler, scourge of evil everywhere & boon companion, asked me some questions which I finally answered. It's been a while since Petey practiced his oboe, at least in the strip. I figure it's something he does every day whether it's mentioned in the strip or not. Like the family eats dinner every night, but it's not funny enough to be worth mentioning. Hey, these people can't be funny all the time, you know. They've got lives of their own too.For earlier examples of Petey's musicianship, but not on the oboe, see here and here. This comes awfully close to "isn't that cute" territory, and would cross over with both feet if it wasn't so disgusting. I'd guess that Dill's never had a piece of clothing that wasn't a hand-me-down, so you'd think he would've noticed the crumbgutters sooner. And that's a word I'm hoping to foist on the English language in a big way, so watch for five solid weeks of crumbgutter jokes in early 2011. I'll be signing whatever Cul de Sac books are put in front of me at the brand spanking new One More Page bookstore on Monday, December 20th from 7 till 9 PM. 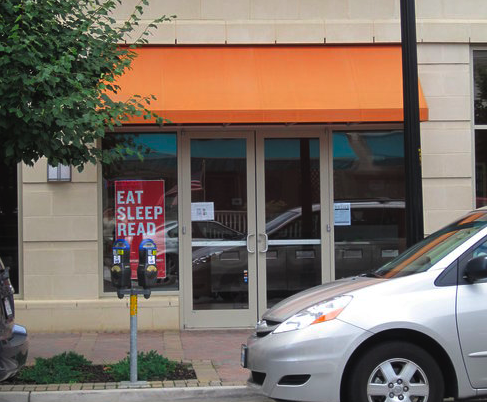 One More Page is located at 2200 N. Westmoreland Street, #101, in Arlington VA, phone 703-300-9746, just a few blocks west of the Lee Highway exit off Route 66. Everybody please come support indie booksellers in general and proprietor Eileen McGervey in particular! Jeez, you turn your back for a few days and look what happens. They haven't used the Dress-Up Corner at Blisshaven and this may be why. I had this all lettered and drawn except for Kevin's last balloon. I wrote half a dozen lines for him but nothing seemed to work until it struck me that he probably looks a lot like his dad. Alice's eyes go all blank when she's being given a lecture, like she's in strategic retreat. The giant Sauron Claus eyeball seemed good enough to squeeze for a few more strips. 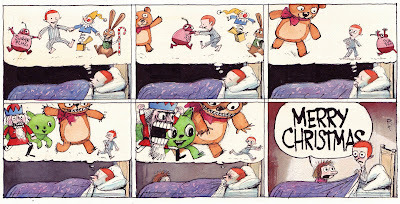 It fits Petey & Alice's darkish view of Santa as a semi-disturbed, judgmental demigod with multiple personalities. I wondered about that thing too. I so rarely get Alice's hair right that I'm always glad when I do. In horror movies, the unseen is always the scariest. I hope this is the last mention of Santa's giant eyeball, I promise. 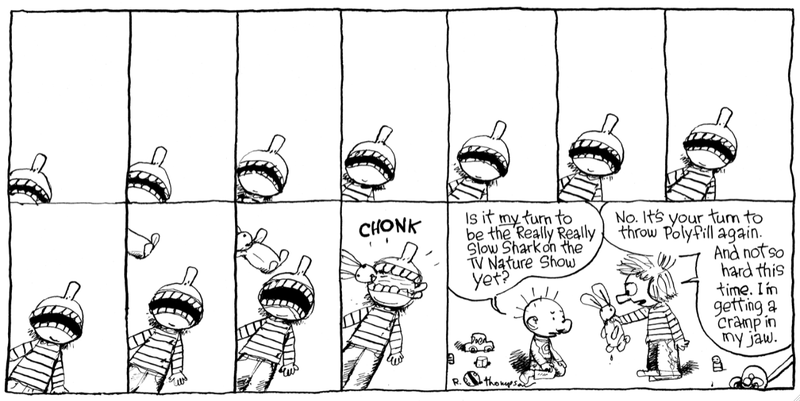 Except for today's strip. 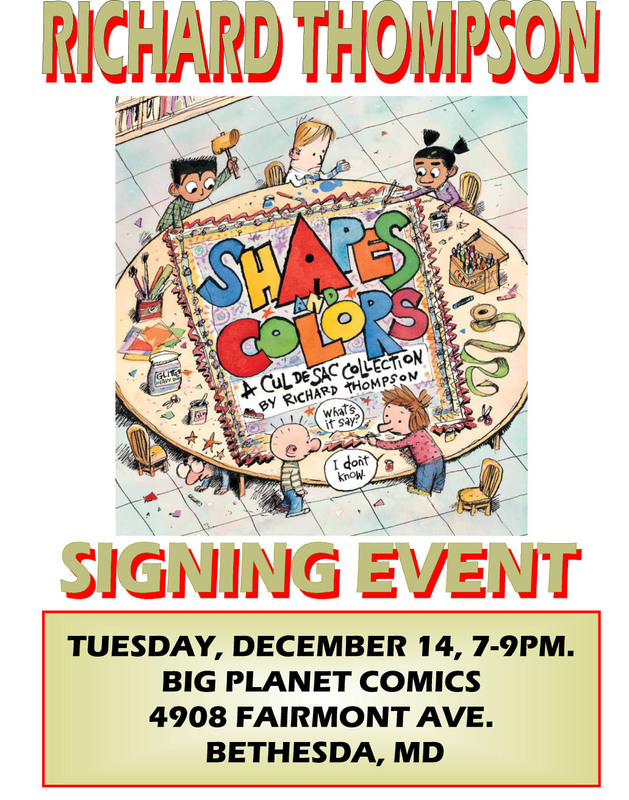 Shapes & Colors Signing at Big Planet! 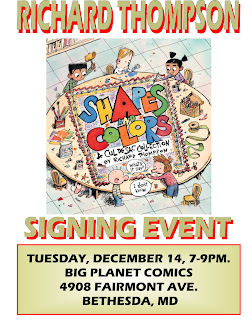 On Tuesday, December 14, 2010, I'll be signing Shapes & Colors from 7 to 9 PM at Big Planet Comics in Bethesda, Maryland. 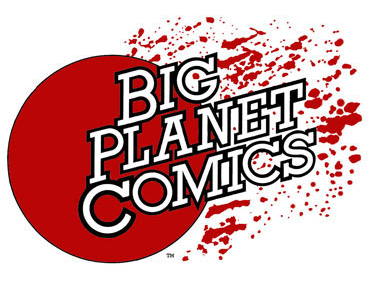 Helmed by master comixtician Joel Pollack, Big Planet Comics are, of course, the premier comics shops in the DC area, its Bethesda location nestled temptingly among the fabled Thousands of Restaurants Everywhere You Look (seriously; you can't walk down the street there without somehow getting gravy or mustard all over your sleeve). All those interested are invited to line up promptly the night before at 4908 Fairmont Ave in Bethesda and please stay behind the marked police lines. For more sensible information, call 301-654-6856. 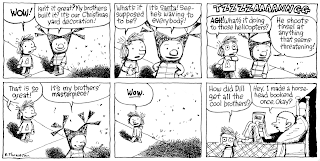 My uncle Jack tells me that Cul de Sac is the first strip out of the gate with a Christmas joke. Yay! 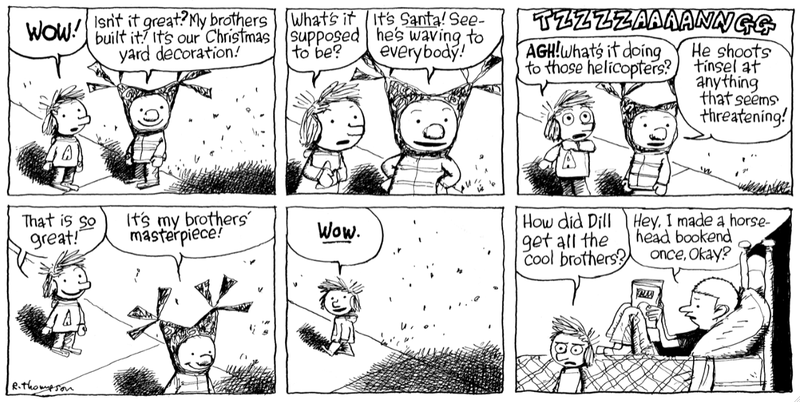 I'd thought about doing a little arc about the Santa candle; maybe it gets left on Dad's car and melts or something. But I didn't. Every Thanksgiving needs to be different. The simultaneous-talking word jumble was better here. And from the look of this strip and others, Mom must run a home business fixing tiny motors. All Grandma seems to make is stuffing, deviled eggs and beet casserole. No wonder her growth was stunted. This place may have appeared in an old Almanac "Restaurant Closings" cartoon. Here's where I discover that bread tongs are hard to draw recognizably. The alternate ending had Dad saying he was thankful no other diners had accidentally ingested Grandma's stuffing. Another story arc uninvestigated. All those desserts was harder to draw than I anticipated. And who serves rice pudding at Thanksgiving anyway? Ew, I hate to imagine what he's doing. There's too much hatching on the slide. A month or so ago U.S.News & World Report announced it was ending its availability as a subscription print magazine and switching to digital publication with some vestigial newsstand sales (see here and here). I freelanced for them for years, going back to the late '80s, doing spots and caricatures and at least two covers. 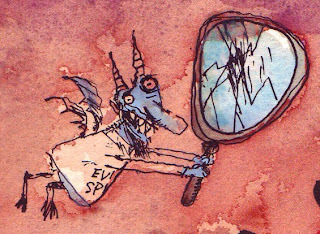 In the mid '90s I started drawing for them every week, illustrating a column in the front of the book called Washington Whispers that featured inside-baseball political-gossip reporting. I'd known and worked with the art director, Michele Chu, for some time and she asked if I'd be interested in a weekly gig with a horrifying deadline that paid decently. Washington Whispers had run in USNWR for some time and several caricaturists had illustrated it, including Taylor Jones, and they were looking for a new one, ideally a local guy. So I said yes. The deal was they'd give me the subject or situation on Thursday around 4 and the final was due on Friday around 11 (which often stretched into the afternoon). I can't remember who the first subject I did was, but I do remember it was a crummy overworked lump of a painting and they asked if I'd please redo it in a looser style, and quickly please, so I did. This is when Thursday nights first turned into all-nighters for me, a habit I'm still trying to shake. Over the next few weeks I got into the job's rhythm; get a call from Michele, do a sketch and fax it over by 5 or 6, ink the sketch onto (Saunders Waterford 140 lb hot press) watercolor paper with a lightbox and stretch the paper and watercolor it, interspersed with periods of dawdling and fretting. Then call them on Friday and a courier would show up, usually Shawn, to pick the finished drawing up. I did this for 9 years, about 50 times a year, and I learned more about watercolor and the limits of human patience than i ever would've otherwise. 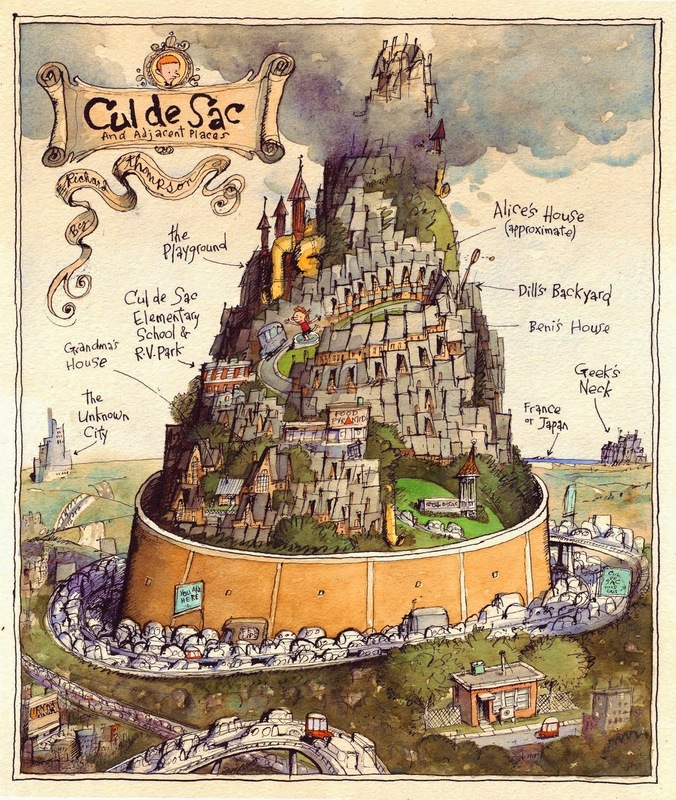 I regretfully moved on in 2004; I was getting burned out and I'd started Cul de Sac in the Post Magazine while still doing the Almanac and they always clumped up on Friday. Ideally, the way freelancing worked was you'd get a few standing gigs, illustrating this or that column or whatever weekly or monthly for various clients and then you'd get one-off type jobs, a cover or a page here or there, With the decline of print this type of illustration has declined too, and I moved into newspaper comic strips I just in time to watch that decline as well. DC is a huge center of publishing, with the government and all the various associations with magazines and newsletters and such. USN&WR, The Atlantic and National Geographic are the only big national publications around here though and it's sad to see USNWR move on too. But I wish them luck wherever they go. 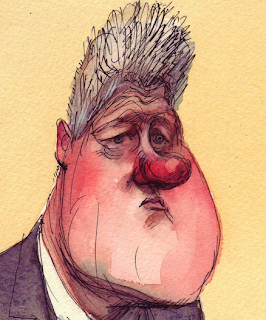 Here's a Clinton I did for them in '98, when he was experiencing some financial embarrassment. First the sketch I faxed to Michele. And here's the final. I like this one, especially the suit. I've got piles of these, some good, some so-so, and I'll post them from time to time. 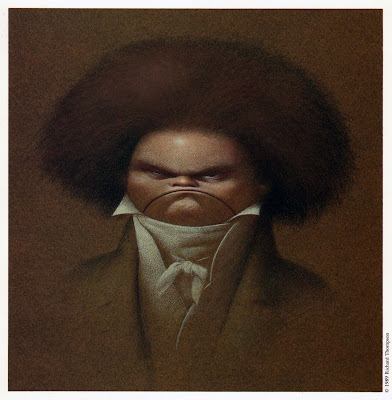 Only the good ones, to present a slanted view of my caricature prowess.